Earthquakes associated with Friday's 7.0 earthquake north of Anchorage as of 5:45 p.m. Sunday. The red dots represent shakes in the previous 24 hours, and the yellow dots are from the past week (with virtually all of them since Friday. The large dot directly north of the city was Friday's quake) Map from Alaska Earthquake Center. Small aftershocks continued Monday from Friday’s 7.0 earthquake, with more than 1,800 measured by early evening. A total of 153 measured greater than 3.0, 18 were at 4.0 or greater and five were greater than 5.0, according to the Alaska Earthquake Center. 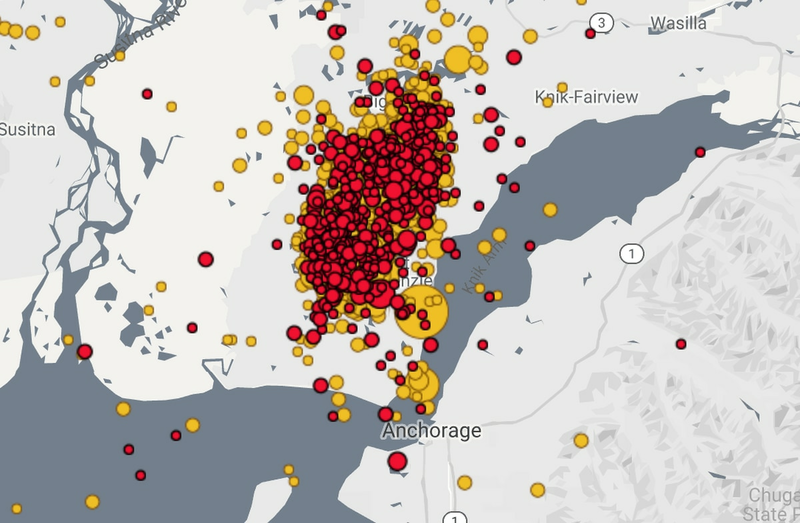 Dozens of small earthquakes rattled Anchorage and Mat-Su on Sunday night and early Monday -- and a few bigger ones probably caused unwanted wake-ups.